I always wanted a shiny, black grand piano. Not that I play or anything, though I have thought of taking lessons from time to time. I just liked the idea of having such a strikingly elegant object in my home, I guess. When we moved into our second house, I saw a perfect spot for one: the nook next to the fireplace in our great room. My husband had the same thought, but it was something we only talked about in passing. We had other, more pressing expenses. Maybe someday, we said. And then someday came. Well, sort of. 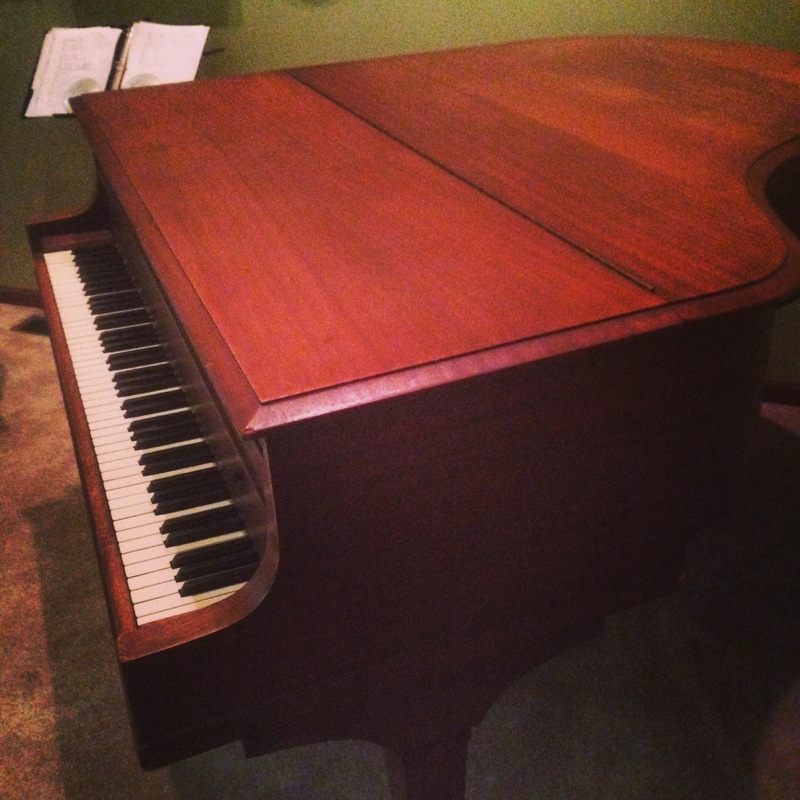 A guy on the trading floor mentioned to my husband that he was selling a piano, and a few days later our great room became home to a used, mahogany-stained Story & Clark baby grand with a broken foot pedal and keys that stick. While I viewed it as a charming antique to occupy a vacant spot in a room, my husband, the musician, had other ideas. He found a piano teacher and signed up our children, ages 7 and 9, for lessons. If it’s going to be in our house, he said, someone needs to learn how to play it. I agreed, recalling having read somewhere about the scholastic benefits of playing piano. Plus, I never learned to play any musical instruments as a child and loved the idea of giving my own kids the opportunity. Little did either of us realize the impact that old baby grand would have on our lives. Our children’s experiences learning to play it were as different as the two of them are from each other. My son took to it easily and naturally; my daughter did not. For him, the piano was a confidante to whom he could pour out his artistic passion, an unconditional friend he would never let go. For her, it was an acquaintance whose company she grudgingly tolerated and eventually abandoned. But for both, the piano unlocked what I hope will be a lifelong love of music. A few months ago, we stumbled upon a sleek, black Yamaha baby grand for sale. It was in mint condition, and it was the perfect step up for a pianist of the caliber of our now teenage son — or at least that was what his teacher had been politely but firmly suggesting for several years. It was also a lot closer to the pristine black piano I had envisioned in our great room so long ago. We snapped it up immediately, our son was thrilled, and we were finally off the hook with his teacher. The Story & Clark, meanwhile, sat sad and untouched in the other corner of the nook. It reminded me of “The Giving Tree,” patiently waiting for its boy to return. I thought of all the times I heard my son play “Für Elise” on it. I remembered him rushing immediately to the piano like a long-lost friend after his week away at band camp. I recalled all the times I welcomed the distraction of his beautiful playing as I worked next-door in my office, enjoying the entertainment too much to remind him to do his homework. On that piano, for a good six years, the soundtrack of our life had played. Today, movers came to take our Story & Clark to a new home. A local family with five young children bought it, and the mother seemed excited about her kids learning to play. It made me happy to know our first piano has another family to enjoy it, and I am sure I will come to love our shiny, new one. Still, I was sorry to see the old one go. When I look back years from now, the house I will remember most vividly is the tiny bungalow in Chicago where we brought home our newborn babies from the hospital. And the piano I will recall most fondly is that Story & Clark with the broken foot pedal and keys that stick. Both were where some of my favorite family memories were made.